In this chapter, we present our view on the diagnosis and treatment of a 72-year-old woman with a 3 cm low-grade T1 tumor located in the bladder dome and without muscle present in the resected specimen. Some factors would suggest a good prognosis; some suggest a high risk for recurrence and progression. We discuss age, gender, and tumor size (or, as a possible surrogate, tumor weight) as prognostic factors. Furthermore, variability in grading and staging and the diagnosis of low-grade T1 are addressed. Tumor location as a prognostic factor and the prognostic importance and technical aspects of the tumor resection are discussed. In light of a complete resection, re-resection, random biopsies and the value of fluorescence cystoscopy are reviewed and commented. Finally, we review additional therapies such as intravesical chemotherapy, BCG, and radical surgery in different clinical scenarios. Babjuk M, Burger M, Zigeuner R, Shariat S, van Rhijn B, Comperat E, Sylvester R, Kaasinen E, Böhle A, Palou J, Roupret M. Guidelines on Non-muscle-invasive bladder cancer (TaT1 and CIS). EAU Guidelines 2013, presented at the EAU Annual Congress 2013. Arnhem, The Netherlands: European Association of Urology; 2013. 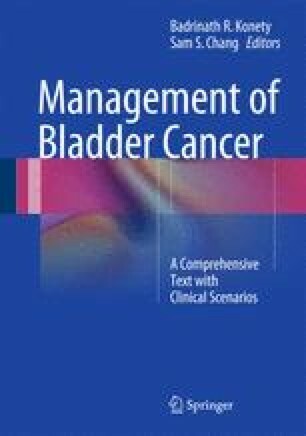 Available from http://www.uroweb.org/gls/pdf/05_TaT1_Bladder_Cancer_LR.pdf.